A suicide bomber blew himself up in a crowded pedestrian mall near Tel Aviv's central bus station Thursday, police said, and at least 15 people were wounded. The bomber appeared to be the only fatality, reports CBS News correspondent Robert Berger. Israeli Web sites identified him as a 20- or 22-year-old Palestinian from the West Bank. Medics said one person was seriously wounded, and four were in moderate condition. Police initially said 20 people were hurt, but later lowered the number. Islamic Jihad, which has claimed responsibility for each of the other suicide bombings since a truce took effect last February, claimed responsibility for this one. The attacker blew himself up after entering a food stand selling shwarma, sandwiches made from meat sliced off a skewer, police reported. The area near the bus station is generally crowded with shoppers and travelers. "This happened in two seconds, he entered the shop, took two steps, and blew himself up," said Ari Sharon, owner of the targeted restaurant, the Mayor's Shwarma. A witness, who identified himself only as Itzkik, said he was eating at the fast-food stand when he began suspecting the man standing next to him. 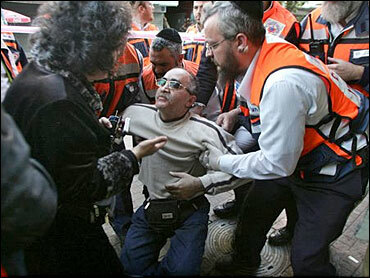 "All of a sudden a policeman came, he pulled him (the suspect) out, and started searching him," he told Israel Radio. The suspect fled, Itzik said, and five minutes later the explosion was heard. Police said the bomber blew himself up in the restaurant's bathroom and may have been trying to prepare the explosive device when it went off prematurely. The old bus station is in a working class neighborhood, where many foreign workers live. Blood, shattered glass and debris covered the ground near shops. The windows of a parked car near the blast were blown out. "The Tel Aviv bombing is another example of the utter refusal of the Palestinian Authority to take any steps to prevent terror against Israel. The Palestinian Authority remains apathetic to preventing this terror," said David Baker, an Israeli government spokesman. Saeb Erekat, the chief Palestinian negotiator, called the bombing an act of sabotage against Palestinian parliamentary balloting scheduled for next Wednesday. "We condemn this attack," he said. "This is an attack to sabotage the Palestinian elections and sabotage the efforts being exerted to revive the peace process after the elections." It was the first suicide bombing in Israel since Dec. 5, when a bomber detonated explosives outside a shopping mall in the Israeli coastal town of Netanya, killing five Israelis. Meanwhile, Israel is mobilizing 4,000 police and soldiers to forcibly remove Jewish settlers from two unauthorized West Bank outposts, military officials said Thursday in a possible sign that acting Prime Minister Ehud Olmert plans to deal more firmly with extremists than his predecessors. Israeli police raided the militant Hamas group's campaign offices in east Jerusalem on Thursday, less than a week before the Jan. 25 Palestinian parliamentary elections. They confiscated material and shut down the office for 15 days. Police said the office was closed because it was being used by a "terrorist group." Israel's 243,000 settlers have traditionally wielded influence far in excess of their numbers. Settlers have set up scores of unauthorized outposts throughout the West Bank, and some extremists have attacked Palestinians without being punished. Over the weekend, settlers angry at the government's plan to evict Jewish squatters from an empty Palestinian market in the West Bank town of Hebron, went on a rampage, burning empty Palestinian stores and homes and scuffling with police. The violence — also aimed at the government's plan to dismantle another outpost, Amona, in the central West Bank — sparked a rare bout of soul searching by Israeli officials who rued being too lenient with extremist settlers in the past. They warned that hard-line settlers were trying to set up a breakaway state in the West Bank. "There is a large group, partly young people, who don't recognize the legitimacy of the state of Israel, not the government, not the law-enforcing institutions, not the police, not the army," Justice Minister Tzipi Livni told Israel Radio. "We have to deal with this." Olmert, who took over after Prime Minister Ariel Sharon suffered a stroke two weeks ago, responded angrily to the Hebron violence and said he would deal firmly with settlers who break the law. Government officials said he was considering holding settler lawbreakers without trial or charge, a measure Israel usually only uses against Palestinians. Although the Hebron eviction notices were sent out before Sharon's stroke, Olmert's tough talk on the outposts could be part of an effort to cast himself as a moderate ahead of Israel's March 28 elections. Olmert is expected to lead Sharon's centrist Kadima Party — which has a huge lead in the polls. "We think there is a malicious trend and cynical political use of the police and the army so Olmert can curry favor with the left," said Hebron settler leader Orit Struck. She said the settlers' conduct in Hebron was due in part to the "bleeding wounds" left from Israel's uprooting of 21 settlements in the Gaza Strip last summer. "We see a great deal of anger and pain that bursts forth when again we are confronted with another expulsion. I propose we don't reach that point again," she said. In east Jerusalem, Israeli police posted a sign on the door of the closed Hamas elections office that said it was being used as "a place for the activities of a terrorist group." The order was signed by Israel's police chief. Hamas is responsible for scores of deadly attacks on Israelis and Israel has barred election activities of all militant groups in east Jerusalem. Polls show Palestinian leader Mahmoud Abbas' Fatah party steadily losing ground to Hamas before the elections. Hamas and Fatah have pledged to avoid violence on election day, reports Berger. In the run up to the vote, Palestinian gunmen have repeatedly taken over government buildings. The non-violence agreement is a tacit admission by Fatah that Hamas will be a significant factor in the new parliament. Israel says that will doom the peace process because Hamas is a terrorist organization that seeks the destruction of the Jewish state.